At John Hazell Auto Repairs, it is our mission to achieve total customer satisfaction in everything we do. We provide car repairs, air conditioning, servicing and on-site MOTs at competitive prices. 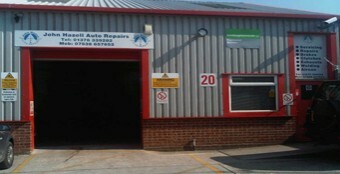 Our aim is to provide customers with an honest, friendly, car repairs and maintenance service. There are no hidden fees or work here; only the necessary work, with our professional recommendations and your explicit approval. We were founded in 1997 and continue to please our customers to this day. We are part of the 'Good Garage' scheme which allows our customers to leave a review about their experiences with our services. We specialise in clutch repairs and air conditioning servicing, but if you're looking for any vehicle repairs, servicing or MOTs in Braintree, Essex; look no further than John Hazell Auto Repairs. Please leave us some feedback, we would love to hear your thoughts!